Future opportunities in an evolving free-from landscape: exploring the main market of “GLUTEN FREE” due to medical reasons (such as Coeliacs) as well as the “other side” of the market (those who choose to go GLUTEN FREE) by Michelle Berriedale-Johnson, Founder and Editor, Foods Matter (Slides are available). Michelle B J Free From Seminar presentation. Understanding consumers with food allergy and intolerance: Using research conducted by YouGov, some interesting observations and themes emerging from this survey of 1,400 UK sample by Louise Vacher, Consulting Director, YouGov (Slides Available). Assessing the global landscape for gluten-free food and drink: Presented by Ewa Hudson, Global Head of Health and Wellness Research, Euromonitor International who touched upon global themes and movements. Some interesting graphics and observations on the different markets. Best Free From Eating Out Award: Cafes & Tea Shop: Labyrinth Hollistic, Stockton on Tees. Best Free From Eating Out Award for Cafes & Tea Shop: Labyrinth Hollistic in Stockton on Tees. And the winner is “Wolfies” of Hove. 2015 Free From Eating Out Awards: Best Pub Restaurant: The Royal Oak, Marlow. And the winner is the Royal Oak, Marlow. Two winners in the Best Restaurant Category: 2 Oxford Place (Leeds) and Oscar & Bentleys (Canterbury). And so excited to be there to hear that Oscar & Bentleys had scooped the Top Prize as overall 2015 Free From Eating Out Award Winner. All the Winners: and the overall 2015 Free From Eating Out Award: Oscar & Bentley. So yet more GLUTEN FREE places to try: many award winning. Such a wide variety of winners from Canterbury to Hove, across the UK. 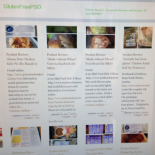 This entry was posted on December 6, 2015 by glutenfreepsd in Gluten Free @Food Fairs, News & Views and tagged 2 Oxford Place, Anthony Worral Thompson, Euromonitor, Food Allergen and intolerances, Foods Matters, Free From Eating Out Awards, FreeFrom Awards, Labyrinth Hollistic, Oscar & Bentleys, Royal Oak, Wolfies, YouGov.